I am going to tell you about a product I've been using twice daily from a new company called Pure + Remedy. You know how fussy I am about skin care. I literally receive a dozen pitches a day here at Chic & Green with people wanting me to review their facial products. Ingredients are so very important to me and I admit I am very selective with the products I will try. If they contain parabens or other nasties, I won't even try them. Once in a blue moon, I am sent products I get super excited about and go on and on about to the point where you probably even get sick of me raving about them. 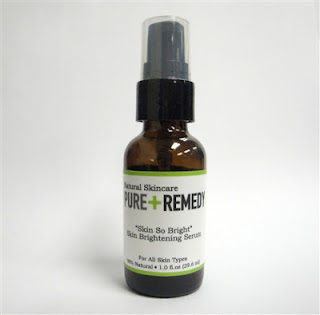 Pure + Remedy just may be quickly turning into one of those favorite natural skin care brands. "The therapeutic properties of botanicals and natural ingredients are the very foundation of our line of products. I am aware that there are numerous natural/organic skin care products out there, but I tried to differentiate our products by focusing on targeting specific concerns/symptoms, and providing the right remedies with the right formula (every botanical extract and ingredient that goes into our formula has an important function for the specific symptom one may have)..."
Michelle also has a background in chemistry and biochemistry, so I love that she really knows her stuff. This is crucial in the skin care industry. She truly knows what she is talking about and brings her education background together with her passion for natural and holistic ingredients. I was sent three products for review. I am not wanting to mix and match right not so I can give fair evaluations of each. In fact, I do have one Chic & Green volunteer tester, Cheddy, trying out the Precious Drops Super Hydrating Serum for me because the ingredients look ideal for her skin. I will report back at a later time on this one and the Damage Repairing Facial Serum. Right now, I am sticking with the one I have been using myself twice daily. Number one, the products I was sent are all serums, which I adore. "And as you may already have noticed, our products are made in the form of serums, treatment gels and moisturizers (will be available later this year) only. This is because I wanted to make the wholesome ingredients in our products to be readily absorbed and become available to your skin immediately. All of the products are lightweight (with some viscosity), fast-absorbing, and gentle enough for sensitive skin and for daily uses. As you mentioned, I also tried to make the packaging attractive (simple yet sophisticated) and minimal (got rid of any unnecessary packaging parts)." My skin is luckily well taken care of and quite healthy. I've long lived by the philosophy that we're given only one skin, so we better treat it with love and respect. That said, the one complaint I have had lately is that my skin doesn't have that natural radiance and glow. It needs a bit of help in that department. I miss that natural "glowing" look and admit that I do take care to find ingredients and products to give me that boost. I don't have wrinkles, acne or other issues. I do have one pigmentation spot on my left cheek and I do have a little bit of dullness to my complexion. Those are my key skin care complaints. When my box of serums from Pure + Remedy arrived, I was thrilled to read the ingredients listing of the Skin So Bright serum -- no nasties at all, but loads of healthy ones! There is hyaluronic acid, kojic acid, salicylic acid, licorice, kiwi, apple, grape, and strawberry...aloe...so many fabulous ingredients. And these ingredients work. *Skin texture has improved already. It feels uniformly smooth (like it would after applying a primer). *The pigmentation spot has already faded with twice daily use -- and it has not been one full week yet. On a grading scale, this serum earns an A+. I do not give this grade to many skin care products. It is well-deserved. I am anxious to try the other serum and to hear and see my friend's results from her testing of the Precious Drops serum. I will keep you updated! I will say, though, that if my interaction with the company is any indication, you will be more than happy with your customer service at Pure + Remedy. This is definitely a company you'll want to add to your "to try" list! *Disclosure-I received the products at no cost for review consideration. I am not affiliated with this company in any way and all opinions, as always, are my own.